Dewalt D24000K Tile Saw, Stand with Diamond Blade Kit. Be eligible to receive a DWE402N 4-1/2" Angle Grinder with this Product During Our Monthly Special!! The D24000S is a powerful, versatile, and lightweight electric tile cutter. It features a 1.5 HP motor, 24" rip cut/18" diagonal cutting capacity, and a cantilevering cart/rail system. The plunge cutting head also tilts to make 45/22.5° miter cuts. Rip cuts tile up to 24" x 24"; diagonal cuts up to 18" x 18"
My "New" Dewalt saw shows some signs of use on the carriage tray but the rest of the saw looks new, did I get a returned saw? We only sell new Dewalt tile saws we do not offer used or reconditioned Dewalt tools, we have brought up the issue of the carriage tray with Dewalt and these "scuff" marks happen during production of the rubber top. Help, my blade is touching the tray on my Dewalt Tile Saw. 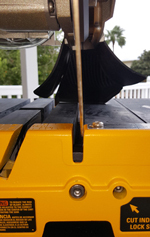 The adjustment screw on the back of the Dewalt D24000 tile saw will prevent the blade from touching the tray when changing from 45 degree miter cuts to 0 degree cuts. Can you get same model in 240V ? The Best Tile Saw I've purchased yet. Lightweight and easy breakdown. No problems of yet, although its only been two months, but very happy so far. Excellent Wet Saw. Have purchased many wet saws in the last 30 yrs. and this is absolutely the best. Cuts 18 inch on diagonal. Would highly recommend it. I was told that this is the saw that most tile contractors are using. Saw was delivered in just a few days from CT to FL. I am very pleased with this saw. Love this saw, but don't expect the 3 year warranty to mean anything. Had to pay Dewalt to have bearings and armature replaces after 15 months of steady but careful use. Dewalt needs to improve inner components or make a HD version for tile contractors. But the design and lightweight is so nice I will probably just buy another one once this one dies. Wish I would have had this one all along. This saw is smooth and powerful with plenty of room for larger tiles. It is lighter weight than others and easy to break down for transporting. Very easy to clean also. A laser and led light would be nice as I work at night a lot but the only thing I really would change is the stand. I wish it was a wheeled design to make it easier to move around within a space. The feet look like they are ready for wheels but so small that I wouldn't trust any of the locking casters I have found to fit. I have only had it a week and can't speak to longevity but I really like it so far. Excellent saw bought this to replace my old MK100. Light weight and easy to transport, table extension and rip guide store in the tub nice feature. Just used on a job to cut 18" porcelain tile on diagonal cuts were clean and straight. About Contractors Direct great selection and prices, Ordered on Wednesday received it the next day Thursday. Second Dewalt 24000. Great saw, good for 1 man to move. You can just bolt together and cut, but well worth the extra hour to dial in using dial-gauge and take all slop out of table, esp if using for longer cuts. I regularily do 24" cuts. Wish it had an LED worklight and a guide-laser. Old saw needs bearings, but is at least 6 years old with steady use. Borrowed this saw from my brother (tile saw contractor) a few too many times, so decided to get my own. Researched this saw and found that the quality is one of the best out there, and this site was THE best price. Shipped when it said it would and was put to use straight away. Very happy and highly recommend. We like the quality of construction and the motor has plenty of power. It is light and the extra pans help contain the water as you cut, reducing cleanup afterward. Has a lot of features which add value, such as the tilting head and tray extender. Great price and prompt delivery. I would highly recommend it. Good design function. A contractor used recently for 18" floor tile worked perfectly. Have used other tile saws without the perfection of the Dewalt roller slide bars and water table. I had used a friends like it. I liked his so I bought my own. Don't buy this saw if you have ever used a belt driven saw. Yes it is light and has some very nice features, but lacking in power, very, very noisy and lots of vibration! The dewalt XP4 blades are not worth the packaging they come in. Contractors Direct was great to deal with though. Great saw that is lightweight and very powerful. Great value with extra blades. I purchased this saw in April 2013 and have finally used it extensively in the past months. The service from Contractors Direct was outstanding with quick delivery. I cut tiles for a shower & 2 bathtub surrounds, foyer floor, and most recently a large family room. In the process I cut diagonals, holes, slots, etc. Floor tiles were all 1' x 2'. I am very pleased with the saw. It has plenty of power, easy to set up, and maintain. I agree with others that a LED light would be beneficial. The other change I would make is to add 9 or 10 more inches to the front of the table to support 2' tiles all the way, though the way it is works. It is fairly noisy, but irrespective of the motor noise, cutting tile is simply noisy. Adequate hearing protection deals with the noise quite fine. 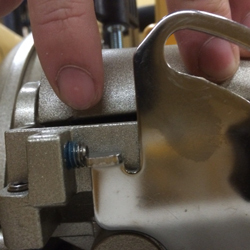 I took someone's suggestion & added an air hose quick connector in the water line to make setup/take down simpler and it is a great idea. I have had no problems and have had no warranty issues nor any issues with Contractors Direct. I am so pleased that I did not settle for a lower priced saw and would purchase the same one over again. Despite the cost, it would have cost me more to rent a tile saw for the number of times I used it. Well built, cuts very good. Well worth the money. Great deal. Shipped very fast. This is the 5th dewalt tile saw I've purchased over 8 years. You can't go wrong with this beauty. I haven't bought five cause they break down but cause they are so reliable I have them on different jobs. They are easy and cheap to repair yourself. A little maintenance over the years and a bearing or 2 and the saw will last years upon years. I've replaced bearing 3 times over the course of about 6 years on one saw but that saw has seen a lot of action... Great product and fast fast shipping!!! After checking out a lot of different Wet Tile Saws, I decided to go for this model. Accuracy is great and plenty of power to cut through the 1" marble tiles I'm installing. Some other reviews mentioned the motor made a lot of noise. Not my experience. Runs great and not too loud at all. My only problem was readjusting the sliding table to make it more smooth. Once that was in order, the table works great. Still a 5 star rating. Also, this is an amazing deal with the extra blades, the stand, and the drill. The drill is powerful! I tried to get Lowes to match the price, but they couldn't beat it and told me to order it here. They were pretty amazed that the price included all the extras! So, great price and great saw. Very much worth the investment.